You are here: Home / Finances / Build a $1000 Emergency Fund in (less than) a year! Just two short years ago, my husband and I scraped by from month to month barely making ends meet and definitely living paycheck to paycheck. We made it a goal and work extremely hard to pay off our debt from student loans and a car loan and start building up our savings. The first step we took was building up a $1,000 emergency fund. There’s a saying that goes along the lines.. “if you don’t have it, you’ll need it, if you have it, you won’t need it”. I’m not sure if that’s entirely true, but the point is the same – if you have money saved up for an emergency then it will no longer be that big of an emergency because you will have that cash on hand to help you get through it. An emergency fund should never be to pay the pizza man or buy a new pair of shoes, though. You have to be extremely careful to keep your savings accessible but not tapped into. Building up our savings was our first step on our journey to get out of debt and living a life where we weren’t fearful every month of unexpected expenses and bills. There’s nothing more important for your peace of mind and security than to save up some money and be prepared for what might come. 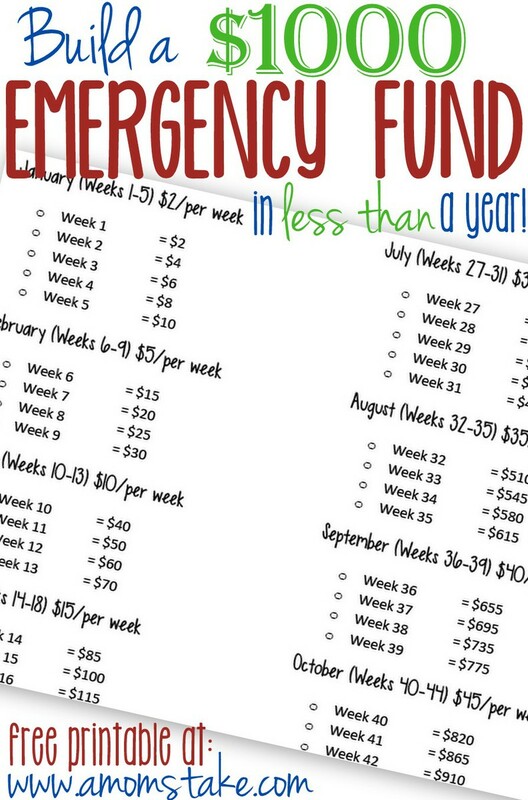 To help you get started, I created a free printable savings guide that will get you on the path towards savings starting with a really easy $2 each week and building up throughout the year. This plan will take you less than a year, in fact just 10 months. If you start this week, you can be done saving before the holidays roll around again and keep using your momentum you’ve built up to set aside for the holidays as well. Click below to print or save this free printable to help you track your savings throughout the year and keep you on course with your goal. 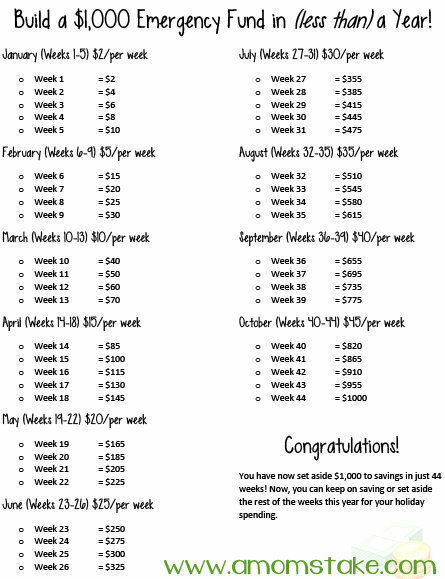 The plan has you save $2/per week throughout the first month, than $5/per week, $10/per week, $15/per week, moving up to $45 per week in October and saving a grand total of $1000! Next, visit our family budget worksheet – with free printable – to help you start getting your finances in order! How do you save for emergencies?